The Pilanesberg is South Africas 4th largest national park. It covers an area of 55,000 hectares. Pretty big. The animals are wild and are roaming. So you get to experience the incredible wildlife in the natural environment-the way a true safari should be done. The park is home to an abundance of wildlife which include lion, elephant, buffalo, leopard, cheetah, rhino, hippo, wildebeest, giraffe, impala, warthog and an ant called Dave. This safari is the closest form of a true African Safari -if you are travelling from Johannesburg that is. The Kruger Park is 5 hours away so not really an option for a day tour or even a 2 day tour. The fauna and flora of the Pilanesberg is diverse and ever changing depending on the regions we cover within the reserve. There are over 360 species of bird. The variety of animal species is largely influenced by the mixture of two distinct landscapes namely the Kalahari and the Lowveld. The Kalahari is a large and sandy savannah where animals such as the elephant and giraffe seem to be the most abundant. So as you can imagine our rangers will be heading there to find giraffe. And where there are giraffe…..there are lions!! The Pilanesberg dams get full of water in the rainy season. So guess we are going to heading in he heat of the day? You guessed it..to the dams. The animals are going to be super thirsty and will be heading there for a drink. And we will be waiting to see them. Nothing better than spending time with the elephants as they cool themselves off in the water. How long does it take to get to the Pilanesberg? The Pilanesberg is only situated a mere 140km from Johannesburg. But the drive can take up to 2 hours depending on traffic conditions. Good thing we have you in our comfortable air-conditioned vehicle hey? Gives you time to catch up on some sleep, mails or failing that, take in the views and listen you our guides stories of the bush. He may also be armed with a few bad jokes but we will provide some duct tape to help keep him quiet if the need arises. How we roll on the budgeted safari tour? 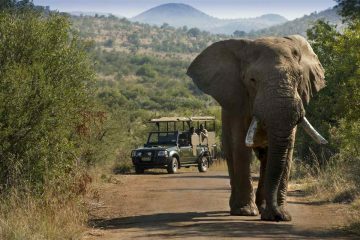 The tour is basically the same as our standard Pilanesberg safari day tour. The only difference is that we have traded in the open air game vehicle for an air-conditioned min van. 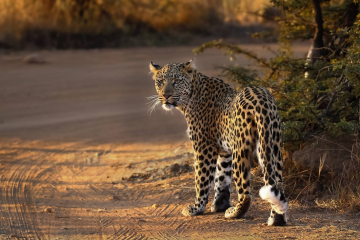 We still include the scrumptious home made lunch, our experienced ranger, park fees and hotel pick ups and of course……6 hours of incredible game viewing in the Pilanesberg. And we have thrown in a scrumptious homemade lunch into the tour. We have traded in the park restaurant for a more chilled out dining experience-South African Safari style that is. We will find a secluded hide that is situated by a watering hole favoured by the animals and allow you to graze on our scrumptious lunch with nature. Better than a restaurant hey? Especially if there you are joined with a herd of elephant. And if you don’t enjoy big groups then this tour is definitely for you. The maximum number of guests on this day our to the Pilanesberg is capped at 6. The advantages of the air-conditioned vehicle? Small groups. We limit this tour to 6 people. 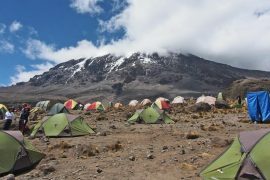 The routes we follow are no different from the open air game vechile so the viewing experience is still maximised to the fullest. What animals would you expect to see on the tour? 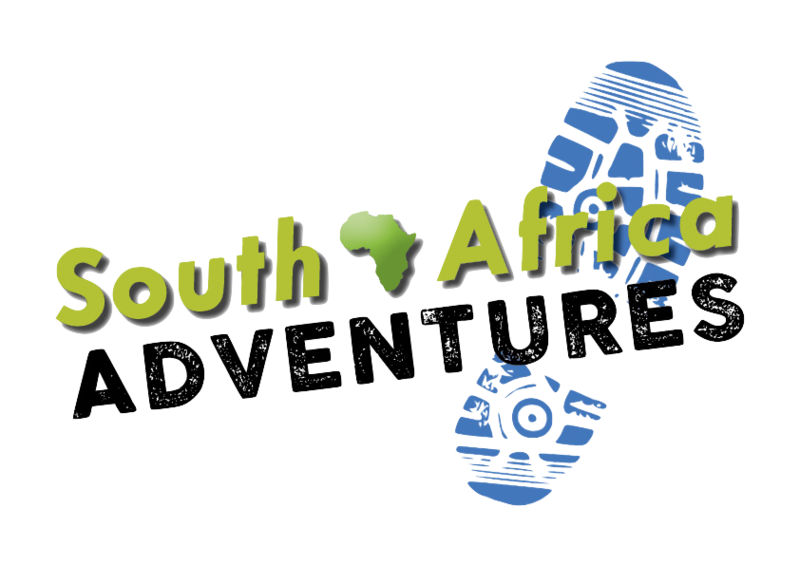 So we have been organising day tours to the Pilanesberg for over 15 years now. Our rangers have an intimate knowledge of the park. So yip, they have a pretty good idea of where to find the animals. Having said that, the animals are wild and therefore free roaming. So there is an element of luck involved in the process. The ranger cannot just wave a magic wand and magically make the pride of lions walk in front of the vehicle. But at least he has an idea of their possible location based on previous experiences. That is also part of the fun. 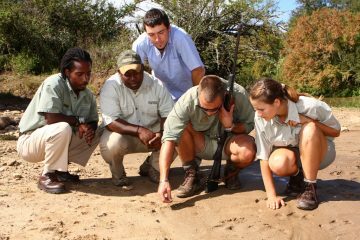 The thrill of anticipation is part and parcel of any Pilanesberg safari experience. The Pilanesberg National Park is part of an extinct volcano and is bordered by the rim of the crater in the form of mountains. This means that the animals are contained within the park. Although it is still 55,000 hectares of our pure awesomeness, at least we know the animals can’t go anywhere. On most of our tours we are pretty much guaranteed to see a host of the mainstream wildlife from zebra, giraffe, wildebeest, impala, hippp and warthog. Will we see the Big 5? Being free roaming there is of course no guarantee. 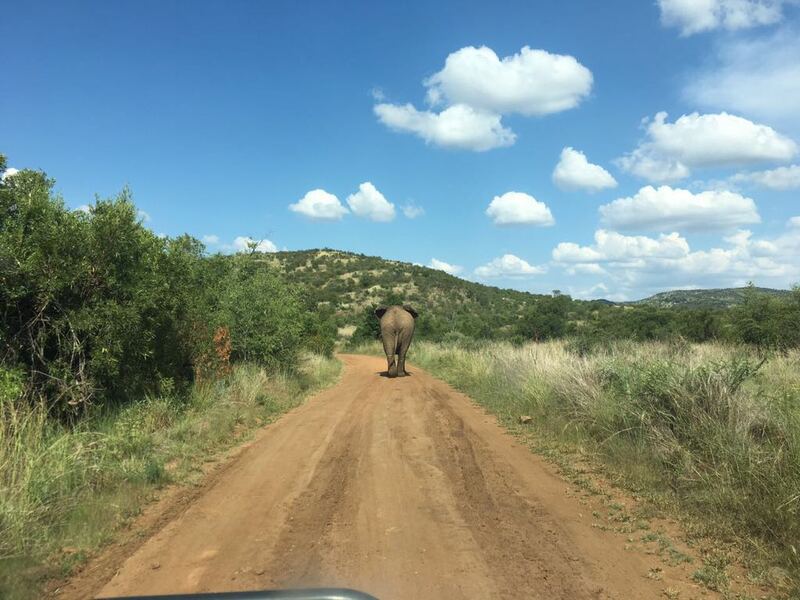 Its all about being at the right place at the right time on a safari in the Pilanesberg or any other reserve for that matter.. We can however say that there has never been a tour where we have not seen elephant and rhino. The statistics of seeing a lion is probably 50/50. Reason being is that lions are nocturnal and sleep for up to 20 hours a day. But again, we are dealing with nature and sometimes we are either in luck or not. What if I am a solo traveller? Not a problem at all. In fact most of our clients are solo travellers. So we just slot you in with an existing group. If you have the Tim and would like to maximise your Pilanesberg safari experience, why not consider spending a night with us. We would get 2 days of wildlife viewing and nothing better than siting around a roaring fire under the African stars with a good glass of wine enjoying a traditional South African dinner. Check out our various tour options. We pick you up from your hotel at 6am. We should arrive in the Pilanesberg National Park by about 8:45am. We then take 20 minutes to stretch our legs before we embark on the wildlife viewing experience. The first part of the tour is from 8:45am until 12:30am. We will enter the park and spend this time in search of the various wildlife species. Lunch is served from 12:30am until 1:15pm.